During a workday things can definitely seem overwhelming as the amount of data we are expected to absorb increases at such a rapid pace. In this fast paced environment it can be easy to misplace an important contact or have another do the same if you are the important contact. 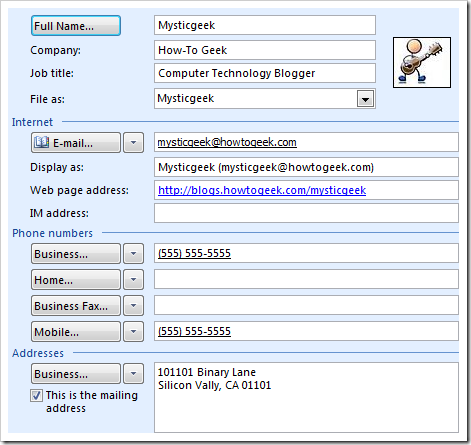 One way Microsoft has made it easy to remember business and friendly contacts is the ability to create Electronic Business Cards in Outlook 2007. You can add these cards to the end of your email messages like a signature. The Electronic Business Card should contain all of the vital information needed to contact you and / or your business. First you need to make a new contact of yourself. 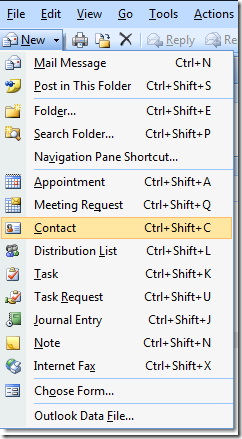 Open Outlook and go to New Contact. 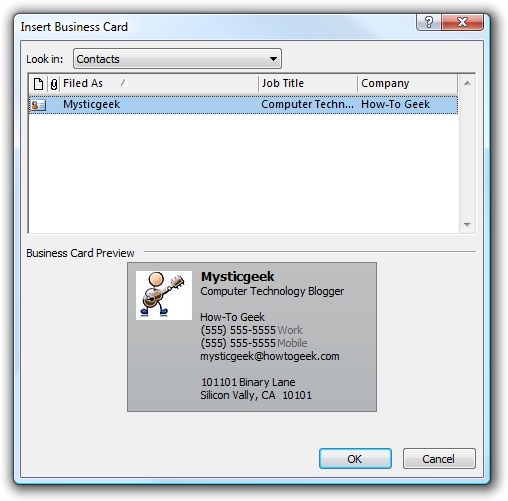 This opens up the New Contact window where you can begin entering in the basic information for the Electronic Business Card. At this point you can also add an image as well. 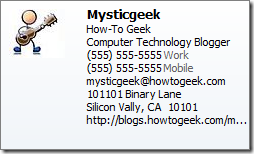 While your entering in the information you will see a preview on the upper left hand corner of the Contact screen. This is the generic view but it allows you to verify the information entered is correct. Now it is time to get a bit more creative with the card. 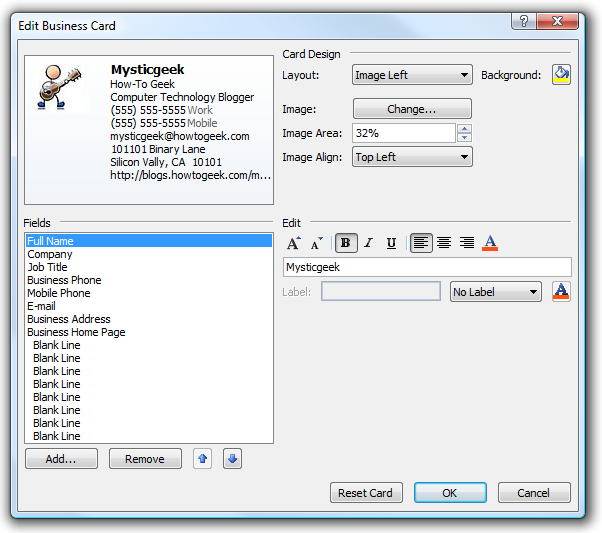 In the Options section click on the Business Card icon to pull up the Edit dialog box. Here is where additional changes can be made to the layout and type of information included on the card. you can change the background color, picture alignment, different fonts and colors, and add more or take away information fields. You can also change the order of the information under the fields section. After you think everything looks good click on Save and Close in the Actions section of The Ribbon. This is what my card looks like after making a few edits in the previous step. Select the business card you just created from you list and click OK. 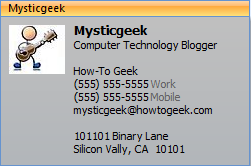 The Electronic Business Card now appears in the message I am composing and you will notice the mysticgeek.vcf file in the Attached field. 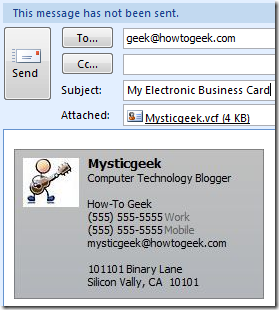 The vCard format is an Internet standard and the person receiving your Card does not need to be using Outlook 2007 to see it. Probably the best practice is to use the card as your signature. To learn more about creating a signature in Outlook you can read my previous how-to. The one difference from that article is inserting your business card by clicking that button and selecting it. If you don’t want to spend a lot of time creating your own Electronic Business Card design you can download Templates from the Microsoft Office site. This is a cool and easy way to go because you can open the template and do various customizations to it. There are also several sites on the Web that you can download them from.